As I have already mentioned, we had a lot of holidays last week. We spent the time in the city where I was born, in my grandmother’s house. Do you have a place where you feel completely safe from the bad things in this world? Where you know that when you step through the threshold all troubles and concerns are left far behind you? That’s how I feel when I go there. The relaxation and tranquility that I devour are just out of this world. I needed to get ready for the trip; and by get ready I mean bake something. Since there was a get together with other relatives we were attending, I set my mind on a double batch of brownies to bring to the meeting, since they are easily transportable and easy to eat, and flourless chocolate cake for my cousin and us. Long story short, the brownies didn’t make it to the meeting. And four grown-ups ended up eating a double batch of brownies in less than two days. Do I regret it? Not for a minute! 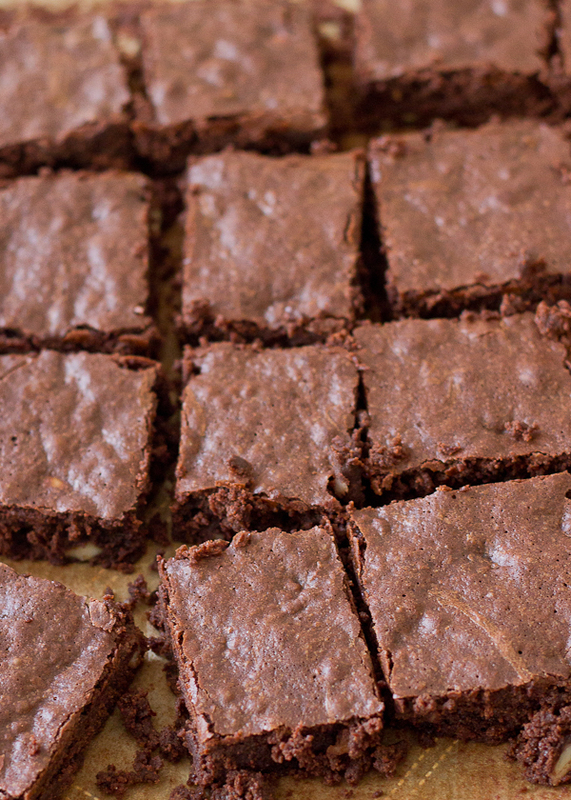 Brownies are invented to make you happy. And I was very happy! Recipe is adapted from Cravings Of A Lunatic. 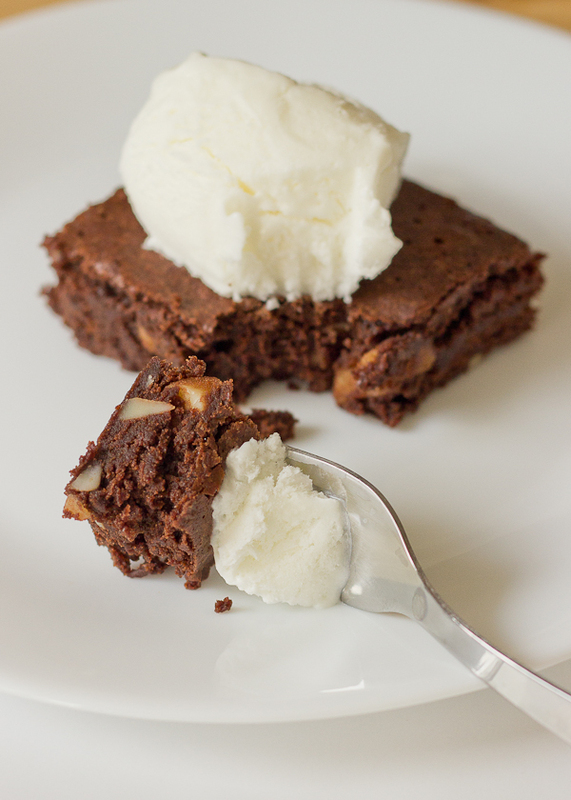 Easy, fudgy and rich brownies, with the addition of almonds for some crunch and extra taste. 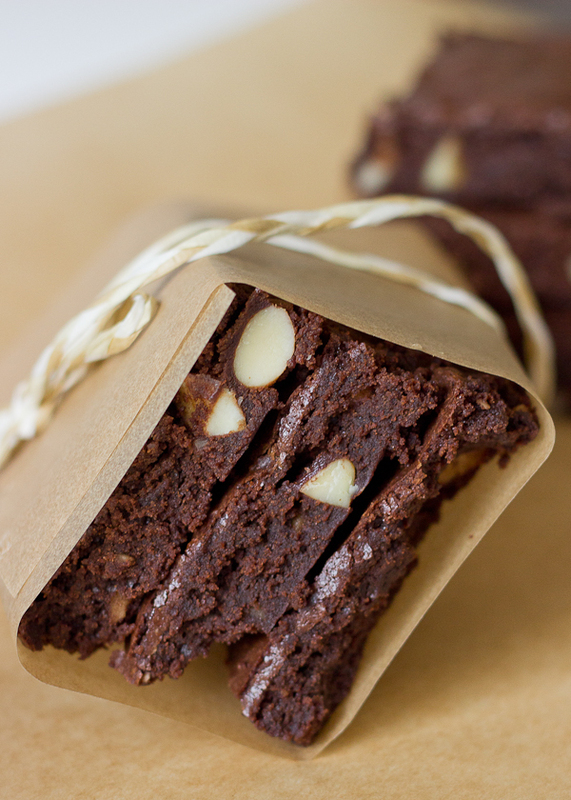 Line the bottom and sides of a 20x20 cm./8x8 inches baking pan with baking paper, overlapping the edges, to easily remove the baked brownies. Chop coarsely the chocolate and place it together with the butter and sugar in a large bowl. Place the bowl over a pot of simmering water. Stir frequently until the butter and chocolate are fully melted, the sugar is dissolved and everything is thoroughly mixed. Remove from the heat and let cool for a minute. Add the eggs while whisking vigorously with a wire whisk. Add the vanilla extract and the almonds and whisk for a minute. In small bowl mix the flour, cocoa powder and salt and whisk together. Add the dry ingredients to the chocolate mixture and whisk quickly until just incorporated. Pour the batter into the prepared pan and smooth the top with an off-set spatula. 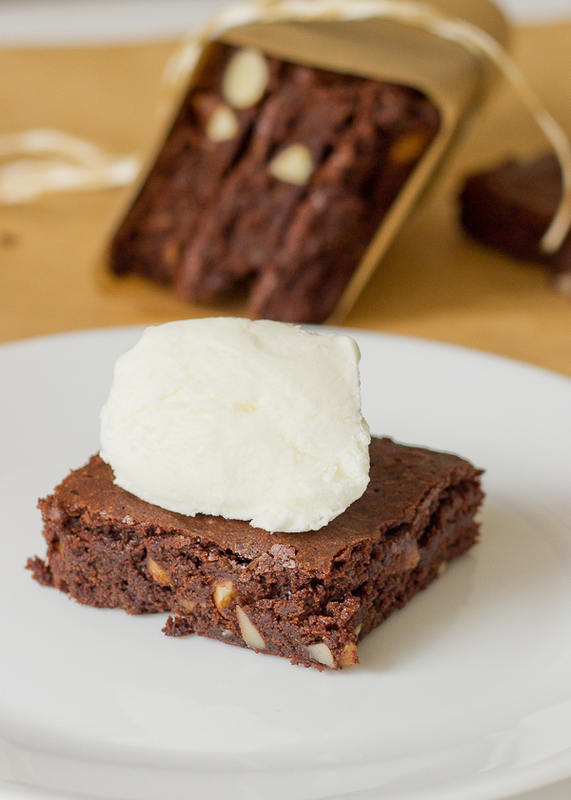 Place in the oven and bake for 35 minutes or until a toothpick inserted into the centre of the brownies comes out clean.